Verbal reassurance: Since most snakebites are either non-venomous or non-lethal, it is imperative to allay the anxiety that is inevitably experienced by a bitten victim, which can prove fatal (neurogenic shock). Immobilisation: Since exertion can enhance systemic absorption of venom, there is universal consensus that the patient should be put at rest, and the bitten extremity immobilised by using a splint or sling. Encourage the patient to move as little as possible. Movement of the bitten part could speed the spread of venom. Remove rings and jewelry from the bitten limb. – If available, firm binding of the splint with a crepe bandage is an effective form of immobilisa-tion (Sutherland wrap; Pressure ImmobilisationMethod). The compression bandage should not beapplied to an incised wound or bruise. – Local Compression Pads (Monash method): These have been found to be useful in victims of bites b Russell’s Viper. A firm rubber pad is applied with cotton bandaging over the site of the bite and the limb is then immobilised with a splint. However, there may be an increased risk of local tissue necrosis, bruising and pain at the site, which should be evaluated over the potential risk of systemic envenomation. Beverages: Use of “stimulating” beverages such as coffee is inadvisable and ineffective. In some cases, it can provoke vomiting, the tendency for which is usually present in the early hours following a bite. Alcohol must never be administered, since it increases the absorption of venom. 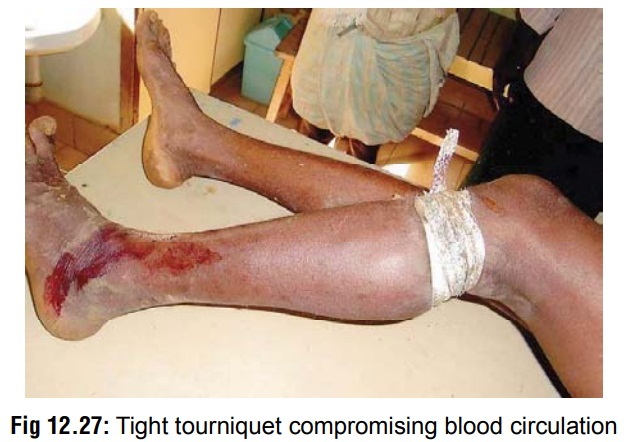 Tourniquet: It is well known that systemic absorption of venom occurs mainly through superficial lymphatics, and therefore application of a tourniquet proximal to the bitesite of a bitten limb in order to prevent the spread has often been advocated (Fig 12.27). But there are serious risks associated with tourniquets and other similar occlusive methods, which include ischaemia and gangrene, damage to peripheral nerves (espe-cially lateral popliteal nerve), increased fibrinolytic activity, congestion, swelling, increased bleeding, and increased local effect of venom. It has also been claimed that subsequent release of a tourniquet which has been retained for some time, leads to a flooding of accumulated venom from the bitesite into the systemic circulation with life-threatening consequences. Because of the dangers associated with it, today the generalconsensus is against application of a tourniquet. Incision and suction: There is much controversy surrounding the issue of incision and suction as a first-aid measure for snakebite. While there have been staunch advocates especially in the past, the current view is generally against such a practice. Some investigators have claimed that effective incision and suctioning (by breast pump or syringe) for a 30 minute period can extract about 90% of venom, even when done as long as 2 hours after the bite. However, some others vehemently deny this, and say that such a procedure can remove only about 20% of injected venom at the most. This is compounded by the serious risks associ-ated with it, including uncontrolled bleeding in patients with incoagulable blood (viper bite), damage to nerves, blood vessels and tendons, and introduction of infection (Fig 12.28). Today, most authorities strongly condemn incision and suction as useless and hazardous. But some practitioners still advocate the method in selected cases, especially if it is done within the first 5 to 10 minutes following the bite. If it is decided to be done, cruciate incisions must be avoided. Parallel incisions may be made through the fang marks, about 1 cm long and no deeper than 3 mm, in the long axis of the limb. Cyrotherapy: Local cooling (application of ice) in the region of the bitesite was previously recommended for minimising the absorption of venom. Today this is universally condemned because of serious risk of necrosis leading to gangrene, which may even neces-sitate amputation. Electric shock: It has been suggested that if snake antivenom is not available to treat a venomous bite, local electric treatment may be done which is claimed to be life saving. The electric shock (25 kv, 1 ma) is to be applied direct to the bite by means of an insulated probe for a couple of seconds, and repeated 4 to 5 times at 5 to 10 second intervals, taking care to ground the area as closely to the site of the bite as possible. However, doubts have been expressed as to the actual efficacy of this method. Today, the universal view is that it is a useless and dangerous method. – For mild to moderate pain, paracetamol can be given. If pain is severe, several authorities recom-mend judicious use of narcotic analgesics such as pentazocine or pethidine, even though in some cases this can be hazardous, e.g. elapid bites, where there may be CNS depression. Aspirin and non-steroidal anti-inflammatory drugs must not be used, since they commonly cause gastric erosions, and could lead to persistent gastric bleeding in patients with incoagulable blood, as in the case of viper bites. –Use of corticosteroids, which were formerly admin-istered routinely, is no longer advocated except in allergic reactions to antivenom. The same applies to antihistamines. –Since vomiting is a common early symptom of systemic envenoming, patients should be made to lie on their side with the head down to avoid aspiration. Persistent vomiting can be treated with intravenous chlorpromazine. Intramuscular and subcutaneous injections should be avoided, espe-cially in patients with incoagulable blood, since they can lead to haematoma formation. Pressure dressings should be applied to venepuncture sites to prevent oozing. – While some authorities recommend prophylactic antibiotics to prevent infection, others denounce this as unnecessary. – Though Clostridium tetani has not been isolated, its ubiquitous nature prompts most authorities to emphasise the importance of tetanus prophylaxis in the form of tetanus toxoid. If the patient has not been previously immunised, tetanus antiserum or tetanus human globulin must be given. Table 12.3 lists measures which are harmful, and must notbe undertaken. Rural folk in India resort to irrational and even bizarre methods (e.g. using the so-called “snake stone”), which must be condemned in unequivocal terms by doctors. Observe every case of alleged snakebite for a minimum period of 24 hours. Late onset envenoming is common in snakebite involving some species such as the hump-nosed pit viper. – Pulse rate, respiratory rate, blood pressure, and WBC count every hour. Platelet counts are very useful in viper bites. A decrease is indicative of a potential coagulation abnormality. – Urinalysis can provide useful evidence of haemoglo-binuria or myoglobinuria. Urinary NAG (N-acetyl-beta-delta-glucosaminidase) has been found to be useful in the early diagnosis of renal damage after Russell’s viper bite. Elevations in urinary NAG levels are both sensitive and specific for detecting early renal damage. –PT (prothrombin time), APTT (activated partial thromboplastin time), D-Dimer, and FDP (fibrin degradation products). –Extent of local swelling and necrosis. Obtain wound culture in necrotic wounds with suspected infection. –Peripheral smear: Often indicates irregularities in the RBC before the appearance of an abnormal clot-ting test. Helmet cells (keratocytes) and schistocytes (Fig 12.29) indicate the onset of micro angiopathic haemolysis (MAHA). – ECG, arterial blood gas (ABG) analysis. Oxygen saturation can be tested non-invasively with the use of a finger oxymeter, which is particularly important in the case of viper bites, where arterial or venepuncture are contraindicated. – Monitor pulmonary function tests (negative inspiratory force, vital capacity and FEV1) to assess respiratory function and need for intubation. – Monitor serum cortisol levels in patients envenomed by Russell’s viper. Alterations in pituitary and/or adrenal function have been reported. Never embark on antivenom therapy as a matter of routine. Apart from the risks and adverse effects involved (vide infra), such indiscriminate use is irrational because Many cases of snakebite involve non-venomous snakes. Envenomation is not the rule even in venomous bites. Antivenoms available are usually effective against specific species of snakes, and are of no benefit against other species. · Pregnant women, small children. The recommended indications have been summarised in Table 12.4. For Indian viper bites, the 20 WBCT (20-minutewhole blood clotting test) is recommended by some investiga-tors, since it is a very reliable blood test to detect any coagu-lation abnormalities. It is also quick and simple, and can be carried out at the bedside with no specialist training. A few millilitres of freshly sampled venous blood are placed in a new, clean and dry glass bottle or tube. This is left undisturbed for 20 minutes, after which it is tipped, and if the blood is still flowing then the blood is incoagulable and ASV should be administered (Fig 12.30). – Timing—Although antisnake venom must be administered as early as possible when signs of systemic or severe local envenomation develop, it is almost never too late to try antivenom therapy. Some investigators have reported beneficial effects even after a lapse of 1 week or more. · In India, polyvalent antivenom is commonly available which is effective against the Big Four: common cobra, common krait, Russell’s viper and saw-scaled viper. It can be procured from VINS Bioproducts, Hyderabad; Central Research Institute, Kasauli; Bharat Serums and Vaccines Ltd, Mumbai; Serum Institute of India, Pune; or Haffkine Biopharmaceutical Corporation, Mumbai. Sea snake antivenom is available from the Commonwealth Serum Laboratories (CSL), Melbourne, Australia (telephone: 619-389-1720; fax: 619-389-1887). · The best form of antivenom is a lyophilised (freeze-dried) powder, which is produced by immunisation of horses with the venom of the snakes mentioned (vide supra). The powder must be reconstituted in distilled water or saline just before use. If the resulting solution is opaque (turbid) to any extent, it has lost its efficacy and should be discarded (Fig 12.31). The liquid form of antivenom has to be kept refrigerated, and is therefore subject to problems of power failure. · size and therefore bioavailability is very poor. Also, if a large amount of antivenom is required, finding a sufficiently large muscular site to inject the ASV will be problematic. o Most of the reactions to antivenom, i.e. anaphylactic and late serum reactions, are not IgE-mediated hypersensitivity reac-tions to horse or sheep protein. This has been confirmed by skin testing for IgE. In addition, radioallergosorbent tests have not found any evidence of IgE being present. o In fact, the very act of administering an ASV test dose may pre-sensitise the victim and therefore make an allergic reaction more likely. o There is also the logical argument which states that even if the patient shows some evidence of early sensitivity, antivenom is going to be required in any case, as it is the only known cure for envenomation. It therefore makes no sense to carry out the test when one then has to administer ASV as it is the only antidote available to the venom. There is no universal agreement on the exact dose of antivenom to be administered in snakebite. Unfortunately, despite widespread use, there are very few clinical trials to deter-mine the ideal dose. Manufacturers base their recommendations on the mouse assay which may not correlate with clinical findings. The apparent serum half-lives of antivenoms in envenomed patients range from 26 to 95 hours, depending on their mode of preparation. The conventional practice is to base the initial dose on the severity of envenomation (Table 12.5). -Pregnancy is not a contraindication. Children require the same dose of antivenom (or even more) as adults. -Venepuncture sites must be dressed with pres-sure bandage. -Repeat the initial dose of antivenom if severe CVS or CNS symptoms persist for more than ½ hour, or incoagulable blood persists for more than 6 hours after the first dose. It must be remembered that systemic envenoming can recur several days after an initial good response to antivenom. While some investigators claim that there is no fixed upper limit to the dose of antivenom to be administered, and enormous doses have been given in some cases, others insist that this is not advisable (vide infra). – Storage of antivenom—Antivenom must be stored in a refrigerator. Lyophilised antivenoms stored atbelow 8ºC usually retain their activity up to 5 years or more. Reconstituted solutions remain stable up to 48 hours. Diluted solutions should be used within 12 hours of dilution. Early (anaphylactic) reaction: Develops in 10 minutes to 1 hour of beginning the antivenom therapy. It begins with cough, urticaria, tachy-cardia, palpitations, nausea, vomiting, head-ache, and fever. The full-blown anaphylactic reaction is characterised by hypotension, bron-chospasm, and angioedema. Treatment involves administration of adrenaline subcutaneously, 0.5 to 1 ml of 0.1% solution (1 in 1000) for adults; 0.01 mg/kg for children. This is followed by an antihistamine (e.g. chlorpheniramine maleate, 10 mg in adults; 0.3 mg/kg in children). Pyrogenic reaction: Develops in 1 to 2 hours of beginning the therapy. It is characterised by chills, goose fleshing, shivering, rise in temperature, sweating, vomiting, and diarrhoea. Treatment involves fanning, tepid sponging, hypothermia blankets, or antipyretic drugs such as paracetamol (5 mg/kg orally, as suppository, or via nasogastric tube). Late (serum sickness) reaction: Develops about 7 days after treatment. It usually responds to antihistamines and corticosteroids. – Contraindications—There are no absolute contrain-dications to antivenom in life-threatening cases of snakebite. Caution may be exercised in atopic and previously sensitised individuals. The reap-pearance of signs of systemic envenomation after the restoration of normal blood coagulation or the disappearance of neurotoxic symptoms is known as recurrence. It is a phenomenon that can appear in both viperine and cobra bites. Therefore, once coagulation has been restored, the victim should be kept under observation, blood monitoring should continue, and in the rare event that recurrence occurs, further antivenom must be administered. It is needless expense to the victim to routinely apply antivenom in the expectation that recurrence will arise. Haemostatic abnormalities: Give clotting factors and platelets (i.e. fresh frozen plasma and cryoprecipitate with platelet concentrates). Blood transfusion may be indicated. Shock/Hypotension: give colloids/crystalloids as needed. Monitor central venous pressure and cardiac output. Dopamine and other pressor agents may be required. Blood transfusions may be indicated in the presence of systemic bleeding. Myoglobinuria: correct hypovolaemia and acidosis. Acute renal failure: supportive care or haemo-dialysis. · Clean bitesite with povidone-iodine, but do not apply dressings. · Leave blisters alone. They will break spontaneously and heal. Alternatively they can be aspirated to dryness with a fine sterile needle. If there is local necrosis, excise the slough and apply saline dressings. It is preferable to cover denuded areas with split-skin grafts. · Infection at the site of the bite can be prevented with erythromycin or penicillin. If the wound has been tampered with, an aminoglycoside such as gentamicin must be added. Secondary infections following improper “unclean” wound incisions (unclean knife or razor) may require broad spectrum antibiotic therapy (e.g. amoxycillin or cephalosporine along with gentamicin and metronidazole). · Intracompartmental syndrome: This results from swelling of muscles within tight fascial compartments. It manifests as severe pain, weakness of compartmental muscles, resistance to passive stretching, hyperaesthesia of areas of skin supplied by local nerves, and tenseness of the compartment. An intracompartmental pressure, meas-ured by either a Stryker intracompartmental pressure monitor (Fig 12.32) or a saline manometer, of more than 45 mmHg (60 cm of water) indicates risk of imminent necrosis. It is a strong indication for fasciotomy to relieve the pressure, but such a procedure must be embarked upon only after blood coagulability has been restored. · Coagulability disorders caused by vipers are usually promptly reversed by antivenom administration. · If coagulation abnormalities are not corrected by antivenom therapy it may be necessary to administer fresh whole blood, fresh frozen plasma, cryoprecipitates (containing fibrinogen, factor VII, fibronectin, and factors V and XIII), or platelet concentrates. Because of the risks involved, caution is advised when taking the decision to use blood products. Heparin and epsilon aminocaproic acid have not been found to be beneficial. f. Hypotensive shock: This can be managed by antivenom therapy, foot end elevation, and vasopressors such as dopamine infusion (2.5–5 mcg/kg/min). It is necessary to constantly monitor central venous pressure or pulmo-nary arterial pressure (Swan-Ganz catheter). – If urine output falls below 400 ml/24 hours, insert urethral and central venous catheters. – If urine flow fails to improve after rehydration, diuretics (e.g. frusemide upto 100 mg IV) and dopa-mine (2.5–5 mcg/kg/min) should be given, and the patient placed on strict fluid balance. – Acute renal failure is very common in the bites of Russell’s viper and hump-nosed pit viper. It is essential that the vital signs are monitored carefully if renal failure is to be detected early. It is important to note that, whilst oliguria is a useful indication of renal failure, studies have shown that non-oliguric renal failure occurs in approximately 30% of cases. – Established renal failure will have to be managed by dialysis. – The onset of renal damage may begin within several hours of a bite with onset noted by the presence of proteinuria, and possible disruption of urine flow. – Administration of antivenom may not alter the course of severe renal damage, and therefore, the treatment of choice is dialysis which corrects the underlying pathology: acute reversible tubular necrosis. Alkalinisation of urine is not recommended as it has not been shown to be effective in reducing nephrotoxicity, and may in fact cause complica-tions such as alkalaemia, hypocalcaemia, and hypokalaemia. · Give atropine (0.6 mg adults; 0.05 mg/kg children) IV to block muscarinic effects of edrophonium. · Administer edrophonium chloride (10 mg adults; 0.25 mg/kg children) IV—2mg at first, then 8 mg after 45 seconds. Estimate duration of lid retraction on upward gaze, maximum interdental distance on mouth opening, forced expiratory pressure, or vital capacity. · If there is convincing positive response, begin anticholinesterase therapy with neostigmine methylsulfate (50 to 100 mcg/kg) and atropine sulfate (15 mcg/kg) by subcutaneous injection every 4 hours, or by continuous IV infusion. · If the patient can swallow, give neostigmine orally (15 mg four times daily), or alternatively pyridostigmine (60 mg four times daily) with atropine (0.6 mg twice a day) or propantheline hydrochloride (15 mg twice daily). · »Instead of the fast acting edrophonium, the test period should be over 1 hour, and the patient observed for this period. · Useful measures are extent of iris (in mm) uncovered, length of time upward gaze can be maintained, inter-incisor width, and FEV. · The dosage recommended are 1.5 mg of neostigmine (IM), and 0.6 mg of atropine (IV). If the patient shows a positive response, a maintenance dose of 0.5 mg IM should be given with 0.6 mg atropine 8th hourly. · Neostigmine is highly effective in the case of post-synaptic bites such as in the case of the Cobra family. There are also some indi-cations that neostigmine may produce good results in the case of pre-synaptic bites such as that of krait and the neurotoxic effects of the Russell’s viper venom, which is also believed to be krait-like. i. Respiratory failure: Keep airway clear. Head low. Semiprone. Jaw elevation. Oral airway, or tracheos-tomy, or cuffed endotracheal intubation. Mechanical ventilation. There are several cases on record of patients bitten by highly neurotoxic snakes, who have recovered completely without antivenom therapy after being mechanically ventilated for a number of days or weeks. Neurotoxic effects are completely reversible with time. j. Rhabdomyolysis and myonecrosis: This is especially likely in the case of sea snakebites. Myoglobinuric nephropathy can be prevented by infusing mannitol 25 grams, and sodium bicarbonate 100 mEq in 1 litre 5% dextrose, over a period of 4 hours. * Urine output and CVP must be monitored. k. A chronic phase that can occur months to years after a bite by a Russell’s viper can produce weakness, loss of secondary sexual hair, amenorrhoea, testicular atrophy, and hypothyroidism. These result from hypopituitarism. Hypoglycaemia may also be present.